One of the most unique pair of antler sconces we have ever run across. 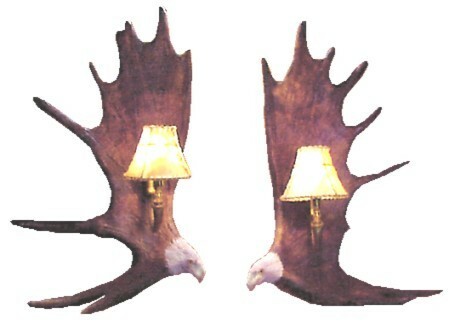 These carved Moose Antler Eagle Sconces depict the beauty and majesty of our national bird. One of the most unique pair of antler sconces we have ever run across. These carved Moose Antler Eagle Sconces depict the beauty and majesty of our national bird. 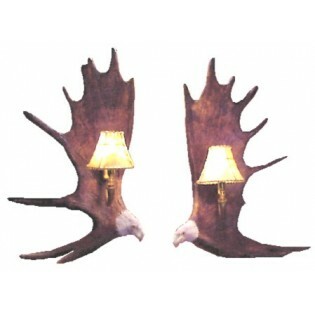 What a statement a pair of these can make in your log home or cabin. Rawhide shades are included. UL listed cord with switch. Size: Overall height is approximately 20-24".